Have you ever noticed that children often seem to be on a mission to create conflict? The minute one child picks up a toy another child decides he absolutely must play with that same toy right now. Boom - it's time to solve another conflict! 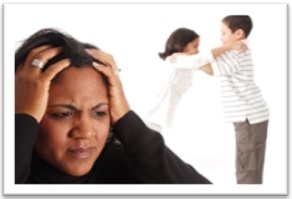 Children learn these important life skills when they struggle to resolve their own conflicts. If you jump in and solve the problem for your kids, it reduces their learning opportunity. A better approach is to act as a mentor when your children come to you with a problem. Resisting the urge to solve your kids' disagreements is not easy. In her book, Easy to Love, Difficult to Discipline, Becky Bailey describes a process to help children solve their own problems. Discern who owns the problem. Offer empathy to the child. Ask the child to think, "What do you think you are going to do?" Encourage the child to come up with his own solution. When you get to steps 3 and 4, you may need to help the child think through the likely consequences of an action. For example, if the child says "I'm going to go hit him!" you could ask "How do you think that will work out?" The last step can be challenging because you are really leaving it up to the child to decide on a solution. In order to stay in the mentoring role, you need to let your child make the decision. My daughter is 3 years older than my son. When they were young and fighting over something, it was all I could do not to jump in and protect my son. I could clearly see that my daughter had an unfair advantage over him. However, I kept reminding myself that if I jumped in to help him I would be teaching him that he needs me to run interference for him. Although he was much younger than her, when I stayed out of the way he found his own methods for defending his position! Since we really weren't concerned about them hurting each other, we stayed out of their fights. If their fighting was too loud for indoors, we would guide them to the garage or deck where they could finish their argument and then come back in. If it was cool or rainy, they solved their problem even faster! A mom told a story of sitting down in her backyard with a book to enjoy a few moments of quiet pleasure. No sooner than she was settled into her comfortable chair when she heard her children and their friends begin fighting with each other. This was not the first time that she had been disturbed by their bickering. She called them over. Remembering how a father taught his children about fighting in Aesop's Fable "The Bundle of Sticks", she asked them to each get two sticks. They set off to get their sticks and soon they were arguing over who had a certain stick first and whose sticks were better. When they finally brought the sticks to her, she asked them to each give her one of their sticks. She tied these sticks up with a ribbon. She then asked the children to break their remaining stick. Each child was easily able to break their stick. Next she handed the bundle of sticks tied with the ribbon to the youngest child to break. However, the child could not break the bundle of sticks. All the children were given a turn and none of them could break the bundle of sticks. She explained to the children that they are each like one stick that can easily be broken. However when they stay together like the bundle of sticks, they are stronger. What a wonderful demonstration of the power of sticking together instead of fighting!